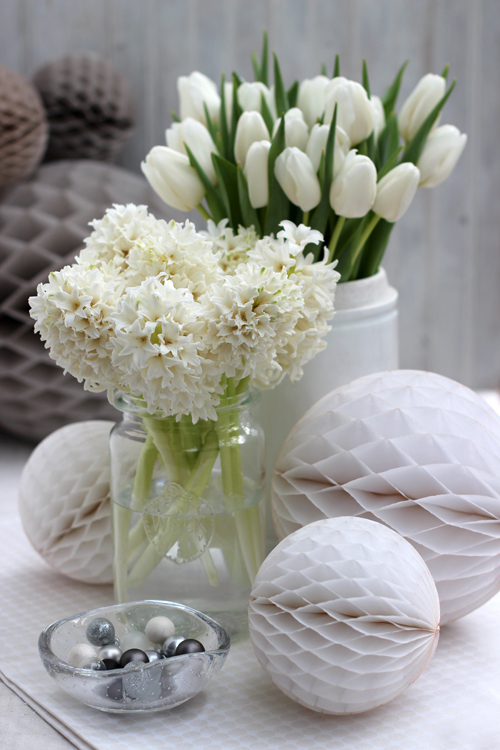 'A Bunch for the Weekend' this week is a combination of white tulips and white hyacinths. 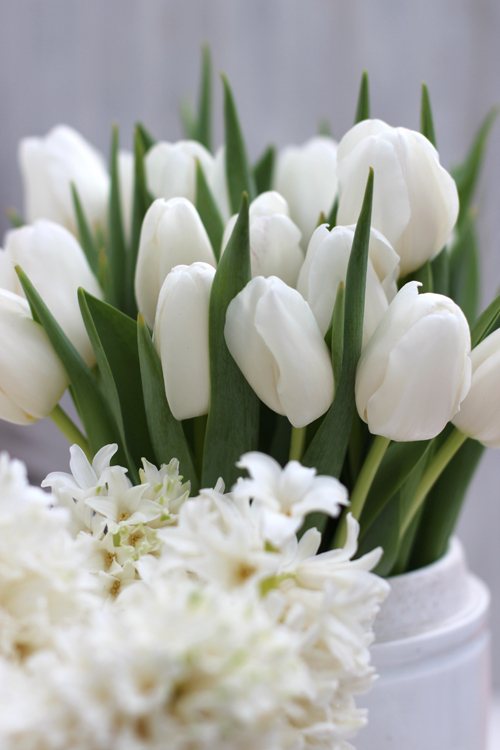 - 20 stems of white tulips. - 7 stems of hyacinths. - 2 vases or containers - in clear glass or white. In this case I have used a white vintage apothecary jar and a clear glass pickling jar. 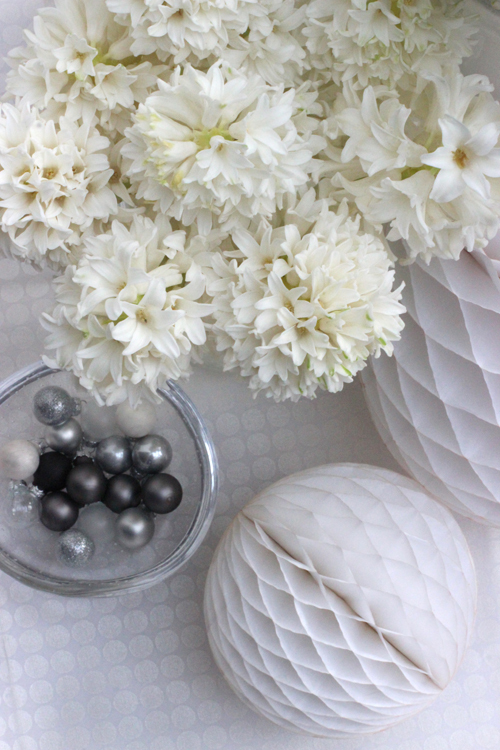 - as props I have used white and grey honeycomb pompoms in three different sizes, a small bowl of Christmas tree baubles in white, silver and grey and a white fabric with a shiny pattern. Condition the flowers by removing any leaves that would end up below the water line in the vase. This is to reduce any growth of bacteria from any deteriorating leaves - at the same time remove any broken or bruised leaves. Cut the stems at a sharp angle - this is to increase the surface area and therefore increase water absorption. Put the cut flowers in a clean container with fresh water and leave in a cool place over night or at least for a few hours, to let the flowers absorb the maximum of water, before making the final arrangement. - Keep as many leaves on the tulips as you can - it's nice to have some green as a contrast in this arrangement. Also keep the stems as long as possible. I have used a container with quite high sides - to keep the tulips contained. I wanted the white tulip flowers to sit closely together and not flop over and become more like dots in space. - I bought the hyacinths as cut flower and when you buy them they come with part of the bulb still attached to the end of the stem. Usually you should keep the bulb-bit - but in this case as I wanted to use a clear glass container - I cut the bulb-bit off to give the whole arrangement a neater look. - The hyacinth flowers should sit right above the edge of the container that also holds the flowers nicely together as a bunch. For anybody that is not going down the red and green or gold and silver route for Christmas - this arrangement would be lovely for both Christmas and for celebrating the New Year. Both flowers are long lasting and even more so if you can put them in a cool place at night. The hyacinths in particular last for a very long time. 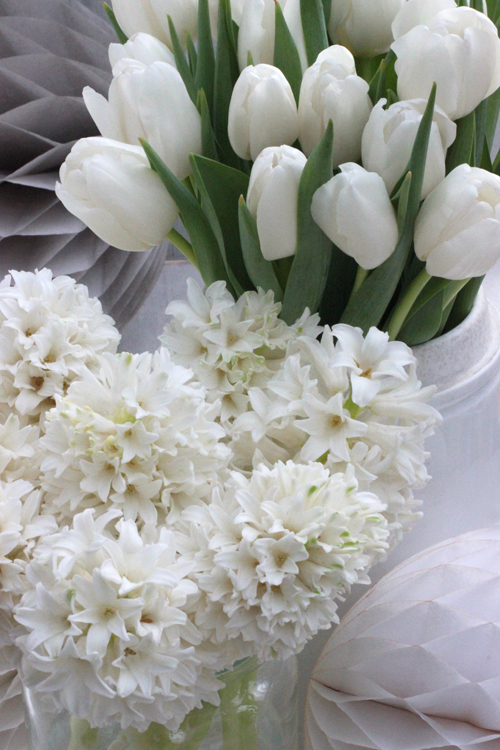 The fresh white flowers is a welcome rest from all the bright colours of Christmas and the scent from the hyacinths is also lovely at this time of year. 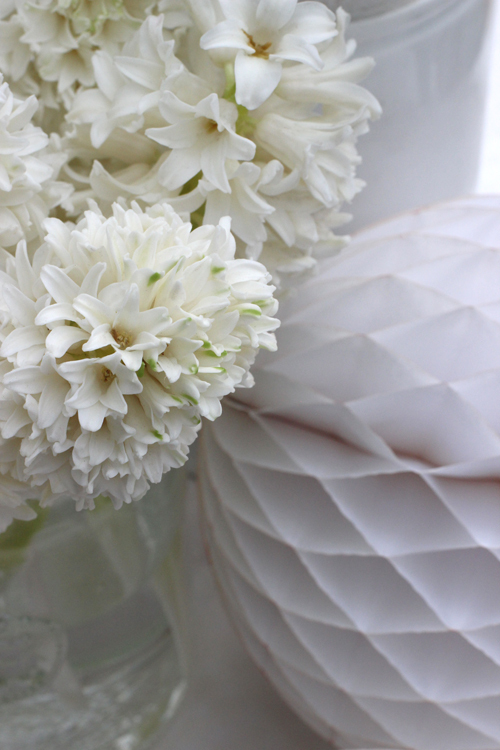 Enjoy your flower arranging and have a beautiful floral weekend! It will be a bit 'slow' here on Of Spring and Summer as I'm taking some time off over Christmas - but I'll be back next week with a little greeting. How beautiful. I love the peacefulness of white. 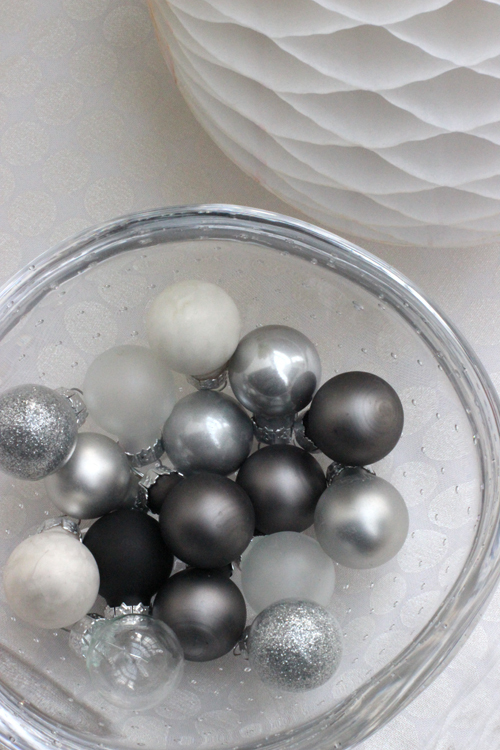 All the Christmas colours can be a little over whelming but this combination is soothing like a Winter landscape.